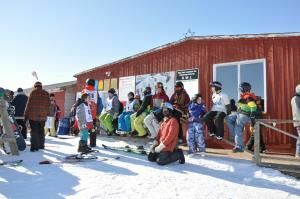 Enjoy the best view in the region from the top of Stony Mountain, Close to Winnipeg this unique venue will make memories for your special event. Available year round. Treat your guests to an experience they’ll never forget. From our unique spaces to our experienced staff, The Manitoba Museum provides one-of-a-kind facilities for special events, dinners, receptions, wedding, business meetings or performing arts events. For 25 or 1200, formal or informal, business or private, the occasion will be imaginative and unforgettable. Located just minutes North of Winnipeg's Perimeter highway, set amongst rolling hills, giant pines & lush forest, Pine Ridge Golf Club provides the perfect backdrop for your wedding! Our gorgeous ceremony site, charming clubhouse and exceptional food provides the convenience of having both ceremony & reception at the same location. Our dining room offers large windows overlooking the golf course, brand new white stone feature wall, audio & visual equipment and plenty of space for a dance floor. Our banquet room has the capacity of hold up to 225 guests. If you’re looking for hotels in Winnipeg, Manitoba near MTS Iceplex, Winnipeg’s James Armstrong Richardson International Airport and the Polo Park Shopping Centre book a room at the BEST WESTERN PLUS Winnipeg Airport. When you stay at the BEST WESTERN PLUS Winnipeg Airport you can expect superior customer service and amenities such as our 24-hour business center, free airport shuttle, Eco-Friendly practices and pet-friendly accommodations. Nothing but the best is offered in our well-appointed guest rooms including pillow top beds, upgraded bath amenities, convenient in-room mini-fridge, free high-speed Internet, spacious work desks, local and long distance call access. Enjoy a state of the art fitness center to burn off those calories open from 6:00 a.m. - 11:00 p.m. After a hard workout, continue your vacation with a dip in our indoor heated pool and hot tub open all year round. To wind down even more, visit our on-site restaurant and lounge, featuring Canadian Sterling Silver Steaks, light meals and casual fare. Our fabulous Sunday brunch is the best value in the city! If you are searching for Winnipeg, Manitoba hotels with meeting facilities, then the BEST WESTERN PLUS Winnipeg Airport is the perfect choice. With over 8000 sq. ft. we can accommodate groups of 2 to 500 guests. Our talented culinary team will take pleasure in customizing a menu for your event or choose one of our corporate meeting or All Inclusive Wedding packages! Whether you're here for a convention or a vacation, indulge in some local sightseeing by visiting the Assiniboine Park & Zoo; Journey to Churchill featuring a 10-acre route highlighting polar bears and other species. Or take the whole family to The Forks Historical Site, Canadian Human Rights Museum and the Seasons of Tuxedo Shopping. There’s more to see and do in our city of Winnipeg such as the Investors Field, home of the Winnipeg Blue Bombers and MTS Centre for a concert or to see the Winnipeg Jets. Make your next event an unforgettable experience in our spacious Royal Ballroom. This stunning event space with modern crystal lighting, built in audio visual and ultra spacious foyer is the perfect place for a full range of corporate or social events. With eight banquet and meeting rooms, combining for 13,000 square feet of space, we can tailor a meeting that fits you and your event perfectly. We can accommodate groups from 20-600, with full catering and complimentary parking. Hosting an event with Sandman is a one-stop, worry-free experience. From all-day corporate seminars to weddings and group socials, we can accommodate almost any function. Our experienced meeting planners will guide you through the many options available, and personalize a package to suit your budget! A member of our Sales Team would be pleased to assist you with your meeting and banquet planning.